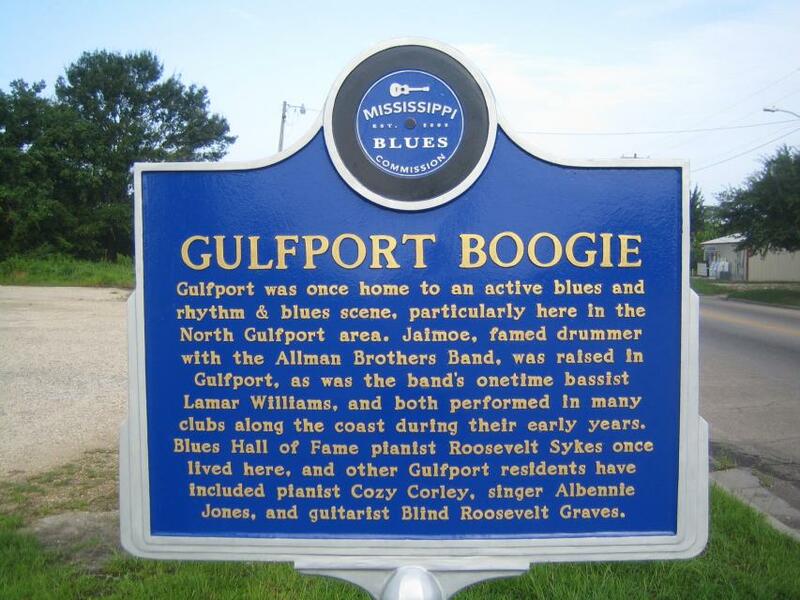 Gulfport was once home to an active blues and rhythm & blues scene, particularly here in the North Gulfport area. Jaimoe, famed drummer with the Allman Brothers Band, was raised in Gulfport, as was the band's onetime bassist Lamar Williams, and both performed in many clubs along the coast during their early years. Blues Hall of Fame pianist Roosevelt Sykes once lived here, and other Gulfport residents have included pianist Cozy Corley, singer Albennie Jones, and guitarist Blind Roosevelt Graves. 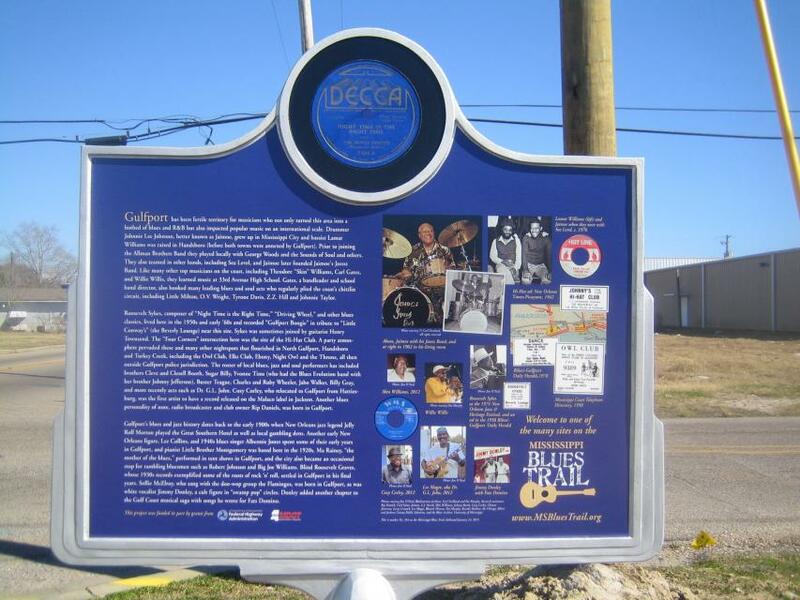 Gulfport has been fertile territory for musicians who not only turned this area into a hotbed of blues and R&B but also impacted popular music on an international scale. Drummer Johnnie Lee Johnson, better known as Jaimoe, grew up in Mississippi City and bassist Lamar Williams was raised in Handsboro (before both towns were annexed by Gulfport). Prior to joining the Allman Brothers Band they played locally with George Woods and the Sounds of Soul and others. They also teamed in other bands, including Sea Level, and Jaimoe later founded Jaimoe's Jasssz Band. Like many other top musicians on the coast, including Theodore "Skin" Williams, Carl Gates, and Willie Willis, they learned music at 33rd Avenue High School. Gates, a bandleader and school band director, also booked many leading blues and soul acts who regularly plied the coast's chittlin circuit, including Little Milton, O.V. Wright, Tyrone Davis, Z.Z. Hill and Johnnie Taylor. Roosevelt Sykes, composer of "Night Time is the Right Time," "Driving Wheel," and other blues classics, lived here in the 1950s and early '60s and recorded "Gulfport Boogie" in tribute to "Little Conway's" (the Beverly Lounge) near this site. Sykes was sometimes joined by guitarist Henry Townsend. The "Four Corners" intersection here was the site of the Hi-Hat Club. A party atmos- phere pervaded these and many other nightspots that flourished in North Gulfport, Handsboro and Turkey Creek, including the Owl Club, Elks Club, Ebony, Night Owl and the Throne, all then outside Gulfport police jurisdiction. The roster of local blues, jazz and soul performers has included brothers Cleve and Clezell Booth, Sugar Billy, Yvonne Tims (who had the Blues Evolution band with her brother Johnny Jefferson), Buster Teague, Charles and Ruby Wheeler, Jabo Walker, Billy Gray, and more recently acts such as Dr. G.L. John. Cozy Corley, who relocated to Gulfport from Hattiesburg, was the first artist to have a record released on the Malaco label in Jackson. Another blues personality of note, radio broadcaster and club owner Rip Daniels, was born in Gulfport. Gulfport's blues and jazz history dates back to the early 1900s when New Orleans jazz legend Jelly Roll Morton played the Great Southern Hotel as well as local gambling dens. Another early New Orleans figure, Lee Collins, and 1940s blues singer Albennie Jones spent some of their early years in Gulfport, and pianist Little Brother Montgomery was based here in the 1920s. Ma Rainey, "the mother of the blues," performed in tent shows in Gulfport, and the city also became an occasional stop for rambling bluesmen such as Robert Johnson and Big Joe Williams. Blind Roosevelt Graves, whose 1930s records exemplified some of the roots of rock 'n' roll, settled in Gulfport in his final years. Sollie McElroy, who sang with the doo-wop group the Flamingos, was born in Gulfport, as was white vocalist Jimmy Donley, a cult figure in "swamp pop" circles. Donley added another chapter to the Gulf Coast musical saga with songs he wrote for Fats Domino. This marker can also be identified by its HM code. You can use the hashtag #HM1JA0 in tweets, and any other place where you might refer to this marker, including when searching on this site.